NOBODY LOVES A GOOD SOAK AS MUCH AS ME. (AND PERHAPS STEVE). 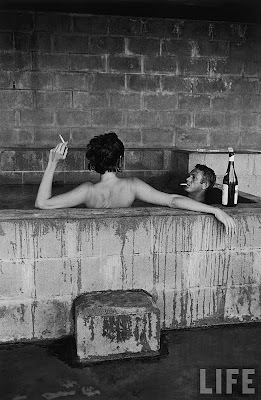 I WAS POKING AROUND THE LIFE MAG ARCHIVES AND FOUND THIS IMAGE OF STEVE MCQUEEN AND HIS WIFE SOMEWHERE IN CALI, SOAKING IN A HOT SPRING WITH STYLE. PLEASE TAKE NOTE: NO ANTIOXIDANT GREEN TEA OR CUCUMBER WATER PRESENT. So there are others rummaging around the Life Magazine archives! Haven't seen this pic before, looks great.